Kelly is an award winning artist who specializes in cover ups, bold color pieces, and dark skin tattooing. 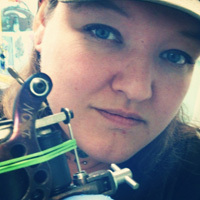 Kelly has been tattooing since 1995, opening the Tattoo Lady in 1997. She loves Howard Stern, tacos, and the color green. Kelly also loves airbrushing, but no, she won't airbrush your kids' baseball helmet.